The microservices architecture style remains a huge part of our architecture related news and feature content. We see strong interest in related topics, in particular domain driven design, and a growing interest in chaos engineering. We believe that data engineering and machine learning are fast becoming key skills for software developers and we’re seeing rapidly growing demand for our content in this area. We’re seeing some signs of consolidation in the cloud space with IBM’s acquisition of Red Hat. Verizon, AT&T, Cisco Systems, and the former Hewlett-Packard have already quit the public cloud business due to a lack of customer traction and competition from AWS. We expect more similar activity in the next few years. ...the characteristics of the vulnerability and potential attacks, why it's necessary to patch cloud virtual machines even though the cloud service providers have already applied patches, the nature of the performance impact and how it's affecting real world applications, the need for threat modelling, the role of anti virus, how hardware is affected, and what's likely to change in the long term. “Tech Ethics in Action Panel”. On a topic somewhat related to ethics, we also saw a surge in interest around regulation, and our Perspectives on GDPR eMag did well. Some of the highlights for 2018 came from new and emerging fields with Holly Cummins’s outstanding three-part series on quantum computing a particular standout. A team at IBM have also formally proved the advantage of short-depth quantum circuits, and Microsoft joined the fray with their Quantum Katas project, which aims to help developers take their first steps in quantum computing using the Q# language. We’re seeing a lot of movement around new computer interaction models, voice and AR/VR in particular. The content of Adam Berenzweig’s talk at QCon San Francisco on rethinking human/computer interaction with neural interfaces sounds like science fiction until you see it in action. It was also great to have Colman Bryant, design lead at Magic Leap, come to talk about multimodal input design for their device. Andrii Zhuravlov-Galchenko’s article “Six Top Tools to Build Augmented Reality Mobile Apps” proved incredibly popular. Amongst the languages that InfoQ covers, we’re continuing to see particularly strong interest in Rust, Swift, and Go. “Servlet and Reactive Stacks in Spring Framework 5” by Rossen Stoyanchev. We’re seeing a growing interest in Kotlin, with Baljeet Sandhu’s “Introduction to Kotlin for Serverside Java Developers” narrowly missing our top five. C# featured prominently in our news coverage with the release of C# 7.3 and the forthcoming C# 8 dominating our newscycle. The series of announcements from the Build conference relating to C#’s future also drew tremendous reader interest. “Async Streams in C# 8” also by Bassam Alugili. 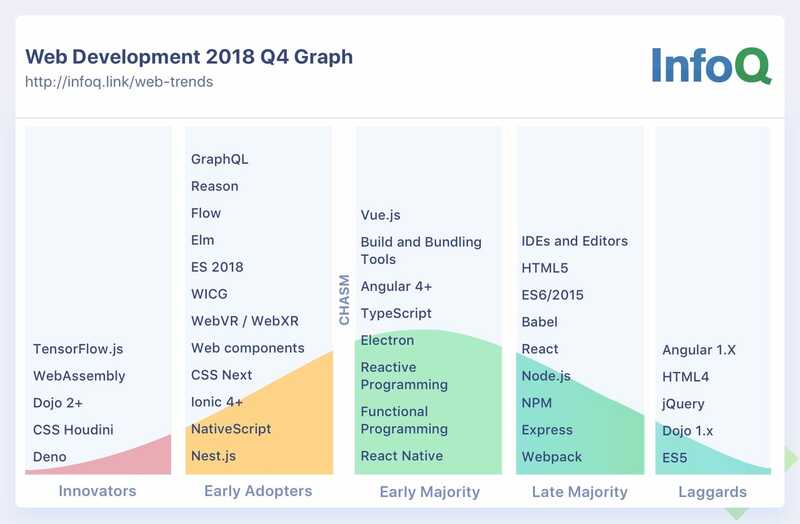 “Enterprise Node.js Apps in 2018” by Jamund Ferguson. It’s unsurprising that distributed computing, and in particular the microservices architecture style, remains a huge part of our news and feature content. We see strong interest in related topics, with both our original Domain Driven Design Quickly book and our more recent Domain-Driven Design in Practice eMag doing well. We’re also seeing a growing interest in resilience engineering, in particular chaos engineering, and our new Chaos Engineering eMag, compiled by Nora Jones, has gotten off to an extremely good start. We see continued strong interest in reactive architecture, with the announcement of RSocket and the experimental reactive relational-database connectivity driver R2DBC during the Spring One conference both demonstrating ongoing interest in reactive-style applications. “Designing Events-First Microservices” by Jonas Bonér. “Chris Swan on DevOps and NoOps, Plus Operations and Code Validation in a Serverless Environment”. We launched QCon.ai in 2018 because we believe that data engineering and machine learning are fast becoming key skills for software developers and we wanted to provide an event specifically for this purpose. We’re seeing strong interest in voice and natural-language topics, with Google’s open-sourcing of their speaker-diarization technology and the BERT natural-language-processing training technique amongst our key AI stories. “End-to-End ML Without a Data Scientist” by Holden Karau. 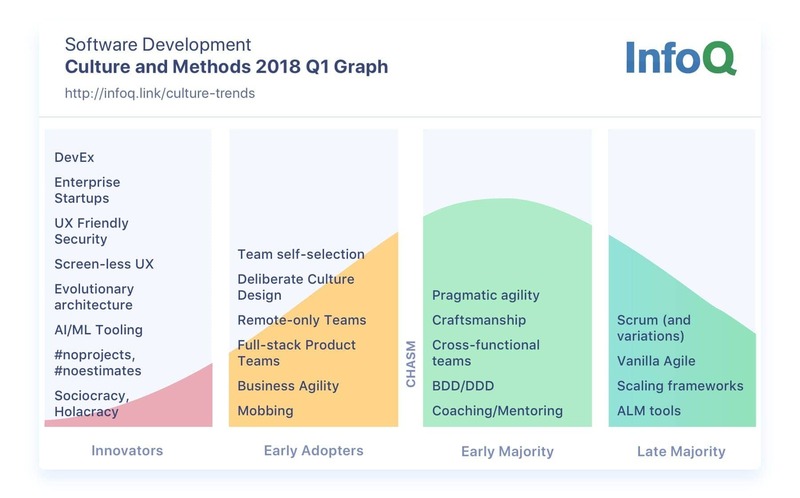 By far, the runaway news post of the year for culture and methods was “Ron Jeffries Says Developers Should Abandon Agile”. The trends report we published at the start of the year also proved extremely popular. We also continue to see strong interest in Scrum, with Scrum and XP from the Trenches by Henrik Kniberg being one of our most popular downloads. We also see considerable overlap between our culture and methods coverage, DevOps, and microservices. “Scrum The Toyota Way” by Ben Linders. “Pooja Brown on Building Great Engineering Cultures”. 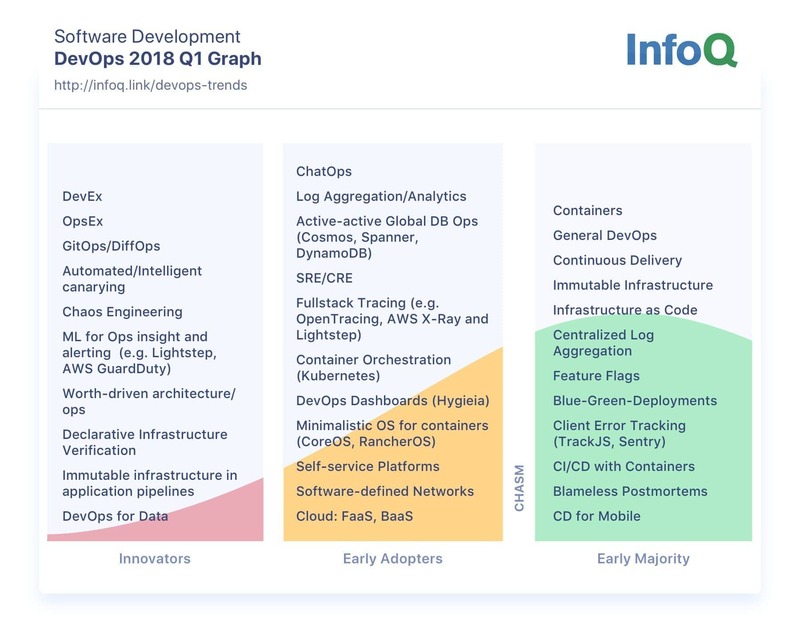 Back in January, we wrote about how Kubernetes had won in container orchestration, and interest in Kubernetes remained strong during the year. The Google Cloud Next 2018 release of Knative, developed by Google in close partnership with Pivotal, IBM, Red Hat, and SAP, sought to consolidate the position. We also saw strong interest in site reliability engineering — another idea popularised by Google. In the coming year, we expect we’ll continue to see machine learning being used to try to solve a variety of problems. Benedict Evans, a partner at Andreessen Horowitz, has suggested that the sectors of fashion, cosmetics, glasses, and grocery retail could soon see disruption. Companies like Stitch Fix are already exploring what happens when you apply machine learning to help shoppers choose outfits and the online supermarket Ocado is amongst those combining cloud, machine learning, and robotics to disrupt grocery retail. As we’ve seen with the Apple Watch’s fall detection and ECG capabilities, wearables open up a range of new possibilities for health and fitness. It is easy to be somewhat blasé about this, but the data that these technologies can provide, combined with machine-learning techniques, open up intriguing possibilities for drug trials, as well as for areas like monitoring sleep patterns and managing common conditions such as diabetes. We expect to see growing interest in alternative forms of human-computer interaction — voice, AR/VR, and neural interfaces. In many cases, the form factors for these still appear to be some way off, but it feels like another paradigm shift similar to that we saw with touch may not be too far away. It seems reasonable to assume that considerably more regulation around privacy will appear over the next few years, as governments and regulators grapple with not only social media but also who owns the data from technology like AR glasses or self-driving cars. Already, other locales are adopting GDPR-esque legislation, for example California’s Consumer Privacy Act was signed into law in June this year, closely following a similar bill in the State of Vermont. Finally, we’re seeing some signs of consolidation in the cloud space with IBM’s acquisition of Red Hat. IBM and Oracle have both struggled to make headway against Amazon Web Services, who announced another huge collection of services at Re:Invent towards the end of the year, and it seems likely that we’ll see further consolidation in the next few years. Verizon, AT&T, Cisco Systems, and the former Hewlett-Packard have already quit the public cloud business due to a lack of customer traction and competition from AWS, and it seems reasonable to assume that we could see other exits and perhaps acquisitions in the next year.